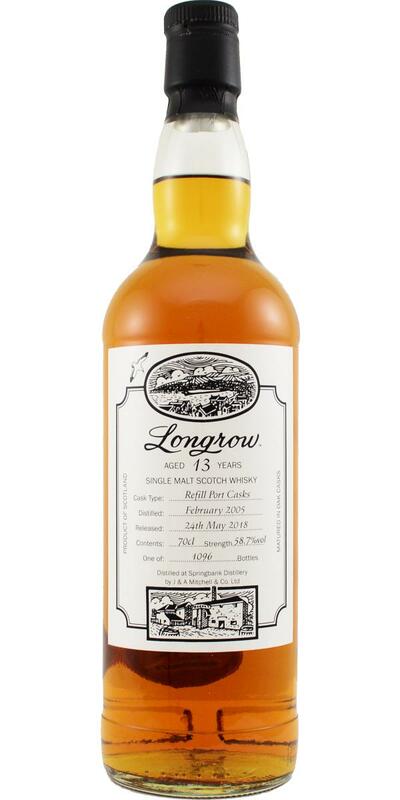 I’d tried this refill port cask-matured Longrow a few days earlier in the courtyard [Blog87], and deemed it well worthy of sixty of my hard-earned pianist’s pounds. N: Lovely toasted oak sugars. T: With coastal hints, a little water brings out the subtle & rubbery mechanics oils. F: Light, dirty peat with a banana-y finish. C: Scores the same as before as it turns out. C: The maturity and composition is good with some dirty complexities thrown in for good measure. For £60, this is a bottle I’m happy to take a punt on. This I tried later on along with the Hazelburn, and found it just as appealing [notes to follow]. Smoke + Port has never disappointed me ..
A nice combination of the red fruits from the port barrel and neat longwax, a bit of sulfur, caramel, overall rather fresh than sweet and heavy. Only the sulfur reduces my opinion a bit, if only slightly. Apart from that, it's great.